Paperweights? Yes, paperweights! If you can't really envision what they are (or why), you are in luck. The Art Institute of Chicago, which houses one of the largest paperweight collections in the world, is more than doubling its permanent Rubloff Paperweight Exhibit from 341 to more than 800 paperweights. For the first time ever, the museum, which has many very rare, antique examples of the art form, will also dedicate a space to contemporary paperweights. The museum's exhibit began when famed real estate mogul, Arthur Rubloff, who collected 1472 paperweights in his lifetime, donated 1,200 to the Art Institute to form the collection in 1978. He was one of a small group of collectors and scholars, who along with some key American, French and Scottish glass artists, helped generate the paperweight renaissance in the second half of the twentieth century. The expansion of the paperweight exhibit is due to the tireless work of the Clark family, the International Paperweight Society Foundation, and the Art Institute of Chicago, through Christopher Monkhouse, Eloise W. Martin Chair and Curator, Department Of European Decorative Arts. "The paperweight collection of Arthur Rubloff is one of the finest in the world," said Monkhouse. "There are few collections that more fully showcase the quality of craftsmanship, technological innovation, intricacy, and beauty of this form. We are extremely grateful for this gift, which will allow us to enhance the presentation of this collection and more than double the number of works of art on display for the hundreds of thousands who visit it every year." Arthur Rubloff was one of many famous collectors of paperweights since the dawning of paperweights as art form in the mid-eighteen hundreds in France. Paperweights, traditionally made from layers of colored molten millefiore or lampworked glass encapsulated in crystal forming decorative designs trapped forever in time and usually the size of your palm, were originally created with the intention of holding down paper in drafty nineteenth century offices. Beginning in 1845, artisans from the three important French decorative glass companies, St. Louis, Clichy and Baccarat, started competing in artist salons, exhibiting their paperweight artistry on the basis of technical difficulty, intricacy of design and overall beauty. These competitions lasted only a few years, and, thus, antique paperweights are very rare and can fetch up to hundreds of thousands of dollars at auction. 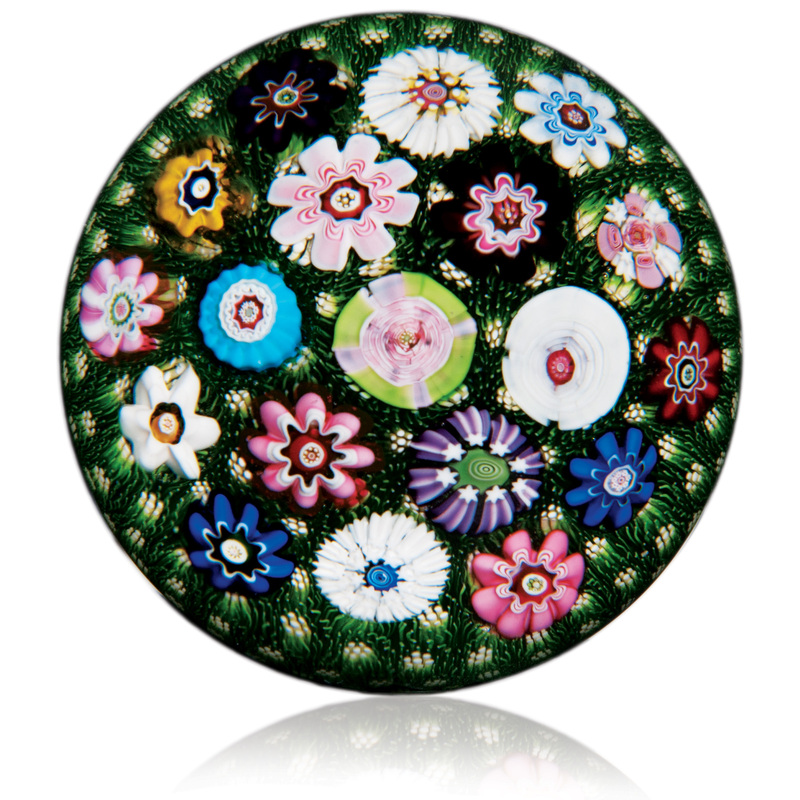 For example, a unique Clichy "Basket of Flowers" paperweight from the classic French period sold for over $258,000 in 1990. Paperweights take me back to a time when craftsmanship was king and based on an individual's talents and dedication unlike today's machine-made goods which create cookie-cutter creations as opposed to one-of-a-kind works of art. The weights that are the most valuable boggle the mind with their hand-made perfection and are rarer than hen's teeth. The techniques of glass-making are especially difficult to master which makes them very special to me. I know that each little cane has to be perfect or it would've been discarded. I was fortunate in my collecting career to have had a fully signed Clichy weight, one of the most sought after paperweights of all time, and the thrill of purchasing it will never be forgotten. If the sky-high prices of rare paperweights and the vector-like determination of collectors to amass hundreds of these detailed orbs pique your interest, there is no time to learn about and experience paperweights like the present. The expansion of the Rubloff Paperweight Collection will be feted with a ribbon cutting ceremony on September 28th at the Art Institute of Chicago at 6 p.m. on the lower level of the museum and will include a visit from famed contemporary paperweight artist, Paul Stankard. A $150 person dinner will follow at the museum in the restored Chicago Stock Exchange room. In addition, paperweight collectors and artists from around the world will descend upon Chicago for the second edition of the "Celebrate The Paperweight Weekend", which runs through Sunday, September 30th. 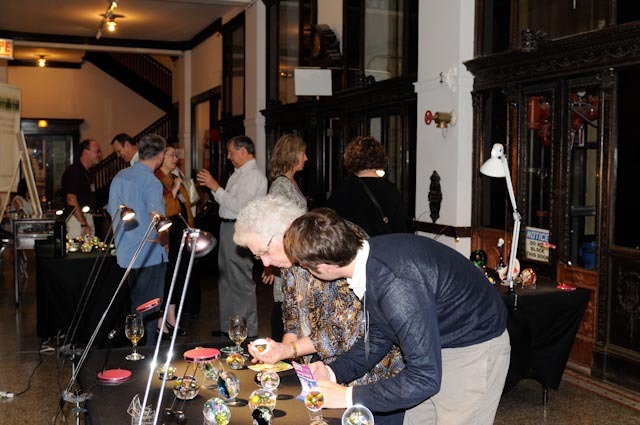 Sponsored by the L. H. Selman Gallery of Fine Glass Paperweights, there are paperweight exhibits and a chance to meet the paperweight artists on Saturday, September 29th at the Congress Hotel at 520 S. Michigan Avenue in Chicago. Saturday the 29th is free and open to the public with lectures by the artists taking place all day. If you won't be able to partake in the events this weekend, the Rubloff Collection at the Art Institute of Chicago and the L.H. 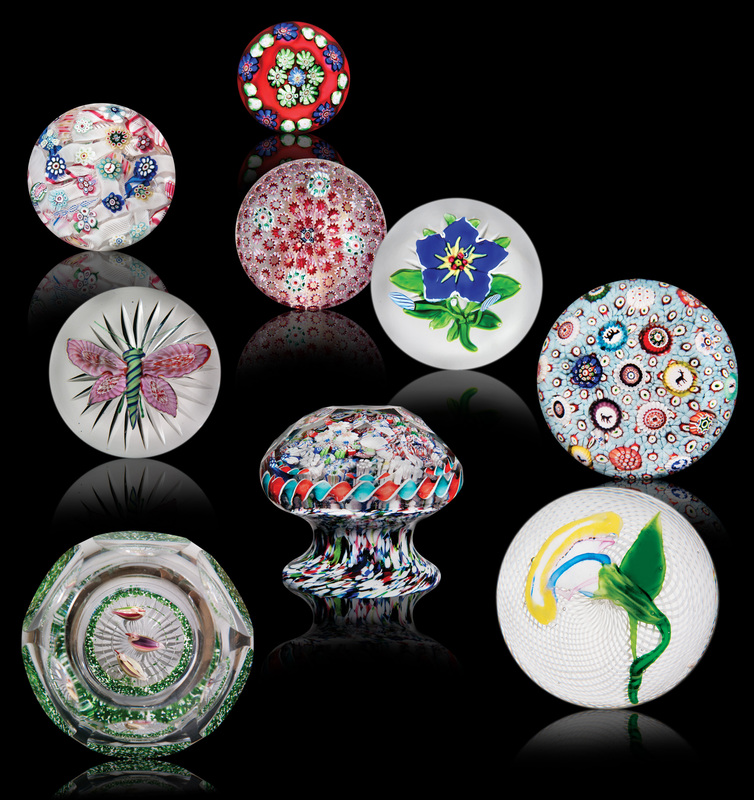 Selman Gallery of Fine Glass Paperweights remain open to the public all year round. You can also view the below video interview and paperweight collection of Candace Jordan to get a taste for the passion that makes paperweight collecting an almost two hundred year old obsession.